Dijara is camping at its best, big sites, shady trees and right on the river. On top of this, wildlife can move freely through the campsites. Last visit was September 2016. 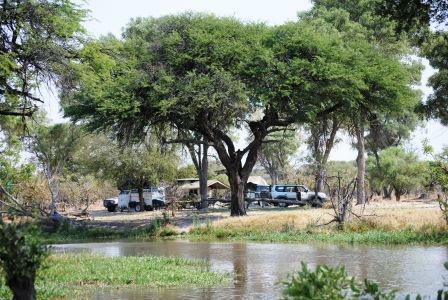 Dijara Camp is located near the village of Mababe just north east of Moremi Game Reserve. It is 40 Km from Moremi North Gate and near the junction of the Savuti/Moremi roads. It is easily accessed from Maun, about 2 1/2 hours drive. There are 16 large shady campsites all on the banks of a river and far apart. Each campsite has its own bucket shower, flush toilet ablution. There is a deck overlooking the river where one can go and relax and see what comes. We saw hippo and elephant there. Spend as many nights as you can here. You don’t have to go on game drives, the game comes to you.